Burma is ruled by one of the most brutal military dictatorships in the world. For decades the Burmese regime has fought off pressure--imprisoning elected leader Aung San Suu Kyi and democracy activists, wiping out thousands of villages in the provinces, bringing miseries from forced labour to refugee camps. 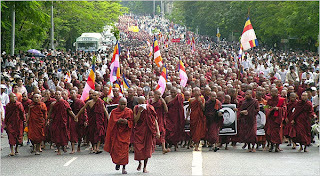 But last Tuesday Buddhist monks and nuns, revered in Burma, began marching and chanting prayers. The protests spread—now they're growing by tens of thousands every day, as ordinary people, even celebrities and comedians join in. Peaceful protesters numbered 20,000 on Saturday, 30,000 on Sunday, 100,000 today. This week, they could win a new life for their country. In the past, Burma's military rulers have massacred the demonstrators and crushed democracy. This time it can be different—but only if the world stands with the Burmese.